My name is Matthew and I am in the 3rd grade. 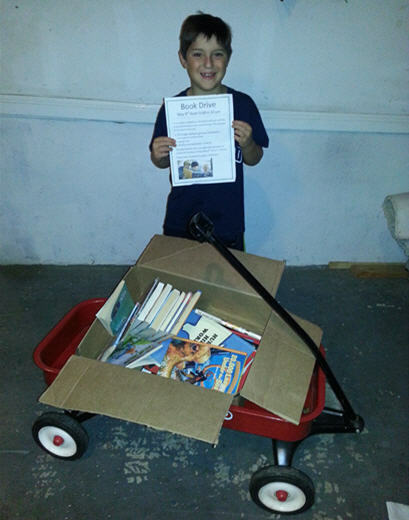 I did a book drive in my neighborhood because I wanted to have books to put in the libraries in Uganda. I made homemade flyers from Microsoft. I passed them out the week before the drive started. I went with my older brother to each house and collected books. When I went to the house, they gave me books and the people could also choose a book from the cart. I wanted to encourage people to be readers. I collected 5 boxes of books. Hi, my name is Mihit and I am in the 4th grade. I did a IIM research project on Uganda. In January, LME was participating in the Walk to Read to raise money for Libraries of Love. I wanted to research about Uganda so I would know more about the country. I learned that 1/3 of the population can speak English even though that is their official language. They have had the same president for 30 years. His name is Yoweri Museveni. Uganda has a rich supply of minerals and crops. It is located on the equator so the weather is usually warm and humid. I am wondering how you got the idea to build libraries in Uganda. There are many countries in the world that are poor, so how did you choose Uganda? I hope to talk to you in the fall when you visit LME. Have a great summer.